“Haunts,” the second exhibit in the two-part “Urban Ruins” series organized by South Shore Arts, runs Feb. 8 through April 21, at the Center for Visual and Performing Arts in Munster with an artist reception from 1-3 p.m. March 3. 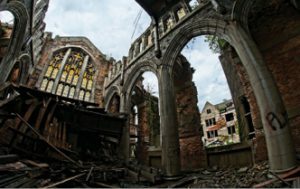 The exhibit features work by guerrilla photographers lured to Gary and other cities to capture the haunting beauty of architectural ruins on the verge of being re-purposed as gardens and other public spaces. Photography by Decay Devils Tyrell Anderson and Lori Gonzalez will be included, along with work by Joey Lax-Salinas, Eric Holubow, Guy Rhodes, Bob Palmieri, Matthew Kaplan, Tom Hocker, Mike Kinsch, Joel Henderson and Dennis Crane. The “Urban Legends” exhibits travel to three Gary venues—ArtHouse: A Social Kitchen, the Gary Public Library and the Marshall J. Gardner Center in Miller—in February and June. 219-836-1839 or SouthShoreArtsOnline.org. On Dec. 4, 1956, Elvis Presley, Johnny Cash, Jerry Lee Lewis and Carl Perkins gathered at Sun Records in Memphis for what became one of the greatest jam sessions ever. Perkins was to record songs with Lewis. Presley stopped by the studio with his girlfriend. Cash was there to talk to recording impresario Sam Phillips. They soon joined together in a jam session with Phillips attempting to re-sign Cash to a new contract, unaware that he’d already signed with Columbia Records. This thrilling musical invites audiences into the studio for the true story of one unforgettable night, when four legends brought down the house with hits like “Blue Suede Shoes,” “Great Balls of Fire” and “Walk the Line.” Production runs Feb. 14 through March 24. 219-836-3255 or www.theatreatthecenter.com. What if the people who are ruining this country were your only friends? In “Swing State,” Bonnie has promised God that she’ll save every little soul in her Appalachian kindergarten class, and if that means risking her job or triggering her chronic back pain, well, so be it. Neil, the new chiropractor in town, sees things differently. A gay, new-age transplant from Brooklyn, Neil is over the moon when his first treatment turns out to be a miracle cure. But Bonnie, feeling things she hasn’t felt in years, has a different response: “Put me back,” she insists. When Neil refuses, they’re off on an epic battle. Feb. 22 through March 8. 219-937-8780 or www.towletheater.org. Either figuratively or literally, and whether from God or Mother Nature, “Waiting for a Sign” explores the use of signage, text and iconography—visual images and symbols—in the work of eight contemporary artists. We encounter signs every day, from billboards to businesses to our own front yards. Signage is part of the typical American landscape. Originally a tool for identification, signs have arguably evolved from an advertising medium to a fine art. Signage has a multitude of jobs: to provide a persuasive message or one of protest, to instruct, to direct, or to provide tools to navigate a search for meaning and truth. Accordingly, these eight artists employ and transform visual language to deliver messages of environmental justice, protest, personal identity and hope. The work included in this show marries verbal and visual communication. Considering text as shape, form and action, the artists use humor, plain text and provocative statements to engage us. Exhibiting artists include Willie Baronet, Diana Guerrero-Macia, Corey Hagelberg, Cheryl Pope, Kay Rosen, Joel Ross, Deb Sokolow and Bernard Williams. Exhibit runs through Jan. 12. 219-874-4900 or www.lubeznikcenter.org. Visit the South Shore Arts Regional Calendar for more information on exhibits, concerts, plays and other arts events at SouthShoreArtsOnline.org. Tune in to Lakeshore Public Radio, 89.1 FM, for “Eye on the Arts” interviews with area artists and arts providers at 8:45 a.m. and 2:45 p.m. every Monday or watch “Eye on the Arts” on Lakeshore PTV at 7 p.m. every first Friday.